If you eat a typical American diet, you may be getting as much as 25 times more omega-6 fats than omega-3 fats. While both of these fats are essential for good health, some omega-6 fats can increase inflammation, so the University of Maryland Medical Center recommends a diet that contains just two to four times as many omega-6 fats as omega-3 fats. Choosing foods high in omega-3 fats and low in omega-6 fats can help you get closer to this goal. Fatty fish are one of the best sources of omega-3 fats, and many of these fish are also low in omega-6 fats. The exceptions to this include tilapia and catfish, which are low in omega-3 fats and high in omega-6 fats, according to a study published in the "Journal of the American Dietetic Association" in July 2008. 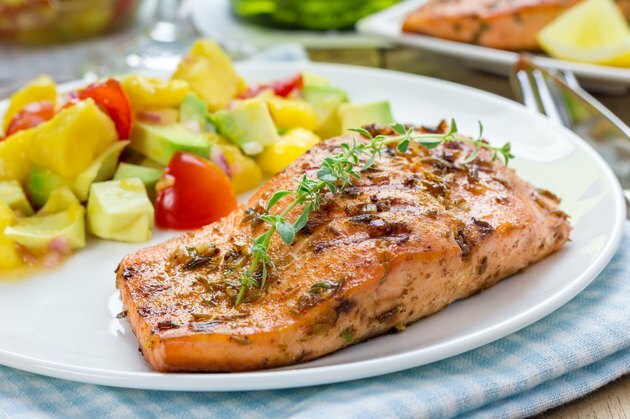 Good choices include sockeye salmon, which has 3.3 grams of omega-3 fats and 1.4 grams of omega-6 fats per 3.5-ounce serving; canned albacore tuna, with 1.5 grams of omega-3 fats and 0.05 gram of omega-6 fats per serving; and mackerel, with 1.8 grams of omega-3 fats and 1 gram of omega-6 fats per serving. The vegetable oil that is highest in omega-3 fats and lowest in omega-6 fats is flaxseed oil, with 8 grams of omega-3 fats and 2.2 grams of omega-6 fats per tablespoon. Canola oil contains about 1.3 grams of omega-3 fats, but it also contains 2.8 grams of omega-6 fats. Avoid soybean oil, safflower oil and corn oil, as these contain high amounts of omega-6 fats. Other types of vegetable oil tend to be high in saturated fat or omega-6 fats and low in omega-3 fats. Many nuts and seeds contain at least some omega-6 fat, but walnuts also provide some omega-3 fats, with about 2.5 grams per ounce, and flaxseeds provide 2.4 grams per tablespoon. Pecans have only 0.3 gram of omega-3 fats per tablespoon, and other nuts and seeds don't provide omega-3 fats, so these aren't good choices if you want to increase your omega-3 consumption while decreasing your omega-6 consumption. Your omega-3 to omega-6 fat ratio isn't the only thing you need to pay attention to when choosing fatty foods. The total amount of fat the food contains, as well as the amount of saturated and trans fats, is also important. Aim to get no more than 10 percent of your calories from a combination of omega-3 and omega-6 polyunsaturated fats, no more than 10 percent of your calories from saturated fat and no more than 15 percent of your calories from monounsaturated fat.